We are beyond excited to be celebrating the release of Donna Grant’s DRAGON CLAIMED with you today! 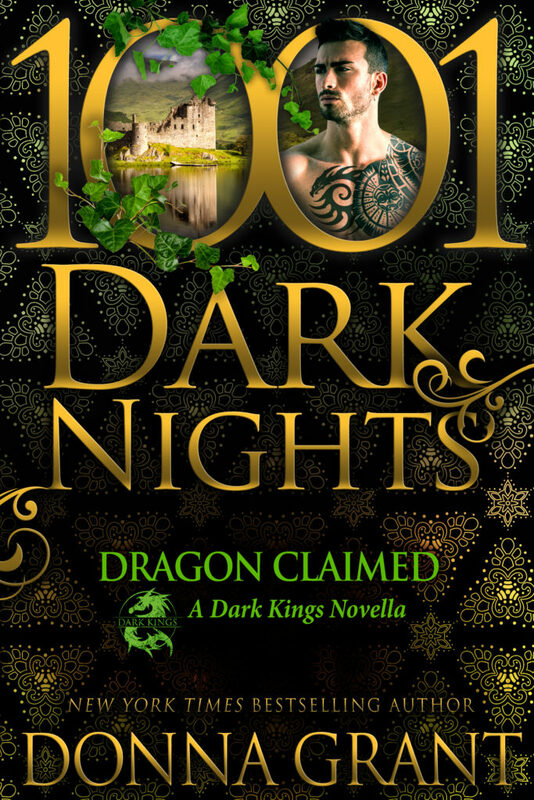 DRAGON CLAIMED is part of the Dark Kings series and 1001 Dark Nights. You can purchase your copy now and read an excerpt from the book below. Purchase your copy of DRAGON CLAIMED today! New York Times bestselling author Donna Grant brings you another sizzling Dark Kings novella. Born to rule the skies as a Dragon King with power and magic, Cináed hides his true identity in the mountains of Scotland with the rest of his brethren. But there is no respite for them as they protect the planet and the human occupants from threats. However, a new, more dangerous enemy has targeted the Kings. One that will stop at nothing until dragons are gone forever. But Cináed discovers a woman from a powerful, ancient Druid bloodline who might have a connection to this new foe. Solitude is sanctuary for Gemma. Her young life was upended one stormy night when her family disappears, leaving her utterly alone. She learned to depend solely on herself from then on. But no matter where she goes she feels…lost. As if she missed the path she was supposed to take. Everything changes when she backs into the most dangerously seductive man she’s ever laid eyes. Gemma surrenders to the all-consuming attraction and the wild, impossible love that could destroy them both – and finds her path amid magic and dragons. Add DRAGON CLAIMED to your Goodreads TBR here! She glanced in the direction that her dog had run. She hated storms. Her parents and Kyle knew that. Why hadn’t they helped her? Anger seethed within her. They hadn’t helped because they wanted to leave Daisy behind. Well, Daisy was hers, and if she had to leave her friends and her home, she wasn’t leaving her dog. She ignored both her parents, who were now shouting her name as she raced after Daisy. If she had to carry the forty-pound dog to the boat, then that’s what she’d do. Just as soon as she found Daisy. Another flash of lightning bathed the land in light, giving her just a glimpse of the dog as she headed toward the house. Gemma ran as fast as her seven-year-old legs would carry her. She reached the house and Daisy. It took her four tries before she was able to lift the dog. She shook badly, but at least she wasn’t trying to get free. Gemma knew her parents were going to be furious with her. She didn’t know why they were sneaking away in the middle of the night in a storm, but the fear in her father’s voice and her mother’s face let her know that the questions would have to wait. In less than two hours, they had packed up all they could and put it on the boat her father owned. She’d asked where they were headed, but her parents hadn’t answered and her brother had shot her an irritated look. Once she got on the boat with Daisy, she hoped someone would tell her something. She hated not knowing what was going on. Kyle didn’t care. He always said that their parents would tell them when they needed to know. Gemma stumbled and fell to her knees. She pitched forward so that she had to release Daisy in order to catch herself, but she managed to keep a tight hold of the leash and pull the dog back to her. Daisy seemed to like being held, so she didn’t put up a fight. “I’m coming!” Gemma shouted, hoping her family could hear her. She couldn’t see the dock through the driving rain and dark. Which was odd. There was supposed to be a light on the dock. She knew the way to the water, so she hadn’t gone the wrong way. But…why wasn’t the light on? New York Times and USA Today bestselling author Donna Grant has been praised for her “totally addictive” and “unique and sensual” stories. 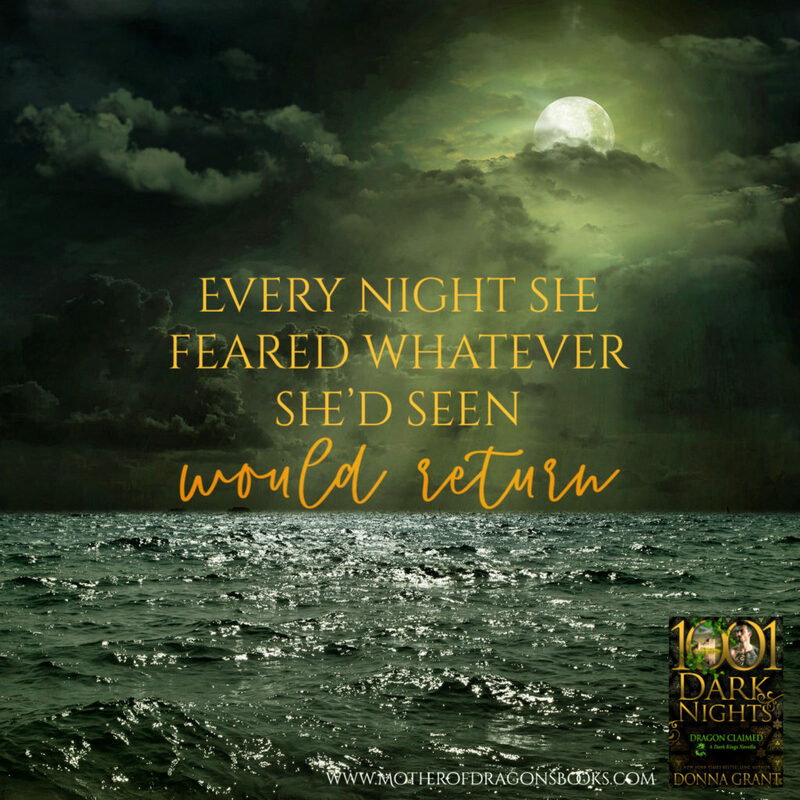 Her latest acclaimed series, Dark Kings, features a thrilling combination of dragons, Fae, and immortal Highlanders who are dark, dangerous, and irresistible. She lives with her two children and an assortment of animals in Texas.